She doesn't hold back on what she thinks of the Duchess of Sussex's wedding day look. Prince Harry and Meghan Markle walk down the steps of St George's Chapel in Windsor Castle after their wedding. By now we're all familiar with Meghan Markle's custom wedding dress. 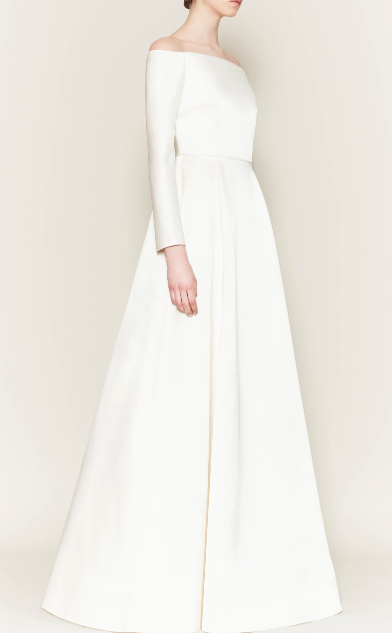 The boat neck, the simple design, the three-quarter sleeves, and the loose fit all combined to make a classic take on the modern wedding gown. 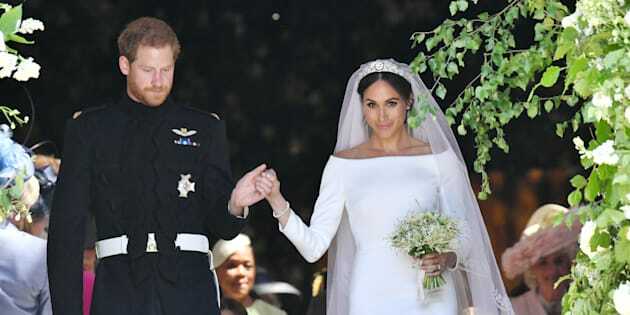 But even though the Duchess of Sussex's dress took months of secret planning by English designer, and Givenchy creative director, Clare Waight Keller, one of Kate Middleton's favourite designers says Markle's dress looks a lot like one of her designs. The Daily Mail reports that designer Emilia Wickstead believes Markle's dress is very similar to Wickstead's "The Helene" wedding dress. Prince Harry and Meghan Markle depart after their wedding ceremony at St George's Chapel at Windsor Castle on May 19. "Her dress is identical to one of our dresses," Wickstead told the Mail. "Apparently a lot of commentators were saying, 'It's an Emilia Wickstead dress.'" Wickstead's dress has some of the same features as Markle's, including the sleeves, neckline, and simple design. The differences lie in the cut (Wickstead's features a more fitted waist that billows out while Markle's sits close on the hips and then fans out into the train) and the train (Markle's has one, Wickstead's doesn't). Emilia Wickstead's "The Helene" wedding dress. Wickstead also said that she thought the duchess' wedding dress didn't fit her properly. "If you choose a simple design the fit should be perfect. Her wedding dress was quite loose," she said. She also let loose (heh) on Markle's wedding day hair — an "undone" low bun. "I was like, 'Hold the wisps back — it's a royal wedding for God's sake.'" But according to Markle's wedding hairstylist, Serge Normant, those flyaways were intentional. "It's what we [Markle and I] decided on together," Normant told Cosmopolitan. "I wanted [Markle] to be able to have [face-framing pieces] in the front, because that style is very her, but when we put the veil on, we tucked them behind her ears to make it look a little cleaner," Normant explained. "I loved that during the ceremony one side was more tucked in and one side was looser, and then when she stepped out [after the wedding] into the wind, the little pieces came out and had movement, which is exactly what I was personally hoping for." Markle's wedding dress, which reportedly cost an estimated several hundred thousand dollars, may look a lot like Wickstead's but took many months to design and create. According to Harper's Bazaar, the search for a wedding dress designer didn't occur until about a month after her engagement to Prince Harry, which happened in November. Markle and Keller met in December, and after a few exchanges, Markle told the designer in January that she had been chosen to design the royal wedding dress. "I think she had seen my work and knew what I did," Keller told Bazaar. "I think she loved the fact that I was a British designer and working in a house such as Givenchy, which has its roots in a classical, beautiful style from the time of Hubert [de Givenchy] himself." Prince Harry and Meghan Markle kiss as they leave at St. George's Chapel in Windsor Castle after their wedding ceremony. The two worked closely together on the design, which ultimately became the iconic gown the world saw on May 19. "From the very start we had a few variations on the design, but then very quickly it [held] to the final creation that you saw," Keller said. "[Markle] was really focused, as I was, on it being absolutely perfect for the occasion. And also knowing what the House of Givenchy has done in its history, I think it was a collaboration that came through that. We exchanged conversations about what would be the ultimate lines and proportions and the scale of the dress, but over time we got to a point where I [knew] she knew exactly what she wanted, having tried some of the toiles and mock-ups that I had shown her. And then it evolved into the final design."